I love this. I also spend a lot of time thinking about the candidates’ wives, and their feelings on these kinds of historic nights. And I’ll be thinking of them tonight, as I watch the election returns roll in, and watch the speeches on TV. Thanks for sharing. Thanks, Samantha! I don’t have cable, but I’ll probably be on the internet getting the updates (in spite of myself!). Fingers crossed! Such a refreshing take on the election. And I have felt like I don’t even know my own country ever since we elected that weasel. I’d actually argue he’s more like a dictator than underhanded, but then I think of certain incidents…can you be both? I kind of wanted to reach over the border and borrow the States’ leader (guess you can see where I stand on their election). Azara, YES. Yes, I think he can be both – and IS, what an overachiever – and I have had that EXACT same feeling about that charismatic guy down south. Great perspective on Ann Romney and Michelle Obama’s potential perspective on the election. We’ve all (I imagine) been in a position to promote our husbands at the expense of our own wishes. I never thought about how the First Ladies might feel in that regard. Thank you, Kimberly… You’re right, I guess we do have those times when supporting our spouses means giving things up or going out on a limb… just on a smaller scale (thank goodness!). I don’t care for our Prime Minister either. But, I live in Ontario so I don’t like the other party any better! I don’t know how any First Lady bears up under the pressure. I truly believe they might actually have the tougher job. I think it’s so nice that your take was on the first ladies. They DO have their work cut out for them. Stacie, you’re so right – and I bet it’s a lot more work than we even can imagine. I would hate it too. I need to be able to blog and blab and run around without a bra. They can’t do that. EVER AGAIN. I imagine it’s a double edged sword. Both of these women are well educated (I could be wrong on Ann Romney but I think she is) and both very well spoken. It’s got to be easier to be First Lady if you’re an extrovert than an introvert. TriGirl recently posted..The Edmonds Half. I Had a Crappy Run. You’re right, TriGirl, Ann Romney got a BA in French at Brigham Young University. And I couldn’t agree more – if you’re an extrovert, First Lady might be a pretty fun gig! Very understanding and even-handed post – refreshing in a heated election season. I agree. I would hate being first lady almost as much as I would hate being president – most stressful thankless job ever. I remember and Onion article after the 2008 election with the title “Worst Job in America Given to Black Man.” As far as their wives, I guess you sign up for it when you marry someone with political aspirations (which I suppose both men realized early in life). But I wonder too if today Ann is feeling some sense a relief amid her pity for her husband. Enjoyed your perspective; I do not envy those ladies one bit. It must take incredible restraint, grace and patience to get through even one day of their lives! Louise, I agree – I couldn’t do it either. Yes – I agree with you; I can’t imagine what it would be like to live with such intense, constant scrutiny–and to know that, unlike the scrutiny that goes with being, say, Madonna, a slipup on your part could have policy ramifications. So it’s not just a bad hair day, or a bit too much wine the night before…it’s the end of “easy,” on some level, even as you live in a bubble where everything gets done for you. deborah, exactly – to have everything you do reflect back on the national leader? Yikes. And I don’t feel that they’ve asked for fame/scrutiny in quite the same way that someone like Madonna has. I love this take on the election. You are so right, these woman have just as much at stake and have worked just as hard to be where they are. What strong women to aspire to. So nice to connect with you through yeah write and NaBloPoMo! Julia, thank you – nice to connect with you too! I wouldn’t want to be first lady, either, and I’m sure after four years of it I would be really over it. Tracie, ME TOO! But on the other hand… it would be awful to see your husband lose, too. Maybe it’s better to do 2 terms and be obligated to step down. 1) I’m so relieved about the US election. 2) Stephen Harper is not MY prime minister. I’ve decided that. He sure doesn’t represent me, and I sure didn’t elect him! 3) I wonder … if a man *would* go back to being the regular ol’ husband he was before he was president. Would he, do you think? Would it be a little like the people who come back from the wars totally changed? 2) I’m with you. Not mine either. 3) I would like to think so, but you’d HAVE to be different in some ways, once you’ve made history, right? I am so with you on this! I’m an introvert. I would snap like a twig if I were in Michelle or Ann’s shoes for 5 minutes. I guess they must really, really want it though. So more power to them. It’s always been kind of a head scratcher to me that Presidential spouses play such a large role in the election. I’m with you. I don’t have the right constitution to be the First Lady. It would be really hard for me to have to agree with my husband ALL THE TIME. Whew, boy…yeah, that’s not happening. Unfortunately, I don’t think people that become this famous ever actually go back to a “normal” life. They’ll have Secret Service with them for the rest of their lives. There won’t be many normal quick trips to the grocery. I think it sounds awful. You bring up a really interesting point. I hadn’t considered how the wives would feel. Sometimes in the heat of the election and the issues it’s easy to forget that those men are people and their wives and families love them as just people, not just as president/candidate. Michelle Longo recently posted..7. Accident Prone. I agree with your dad, IASoupMama. And then if they get there, the stress is just beginning! I hope the same thing for them…that they actually are happy with the paths their lives have taken in the public eye. I couldn’t do it. It must affect Ann Romney’s health. Michelle Obama seems a very hearty person. Gina recently posted..Weirdest Polling Encounter Ever? Gina, I’ll bet you’re right. A life like that has to take its toll. I love that you step back and take the perspective of the ladies. 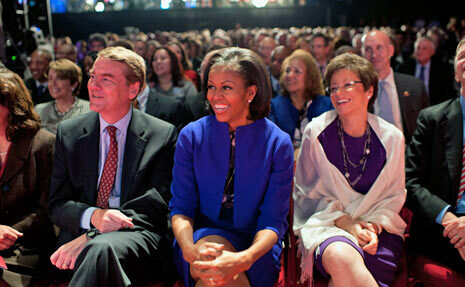 Watching the Obama family on stage Tuesday night (yay!! ), I couldn’t help think about Michelle, and the girls, and how exhausted they must have been. All dressed up – waiting until 1am. I think what contributes to Michelle’s popularity here is that is supportive, yet very much her own woman – not a typical politician’s wife. She has her own causes, her own thoughts, her own drive. I really like your site design! Hi! Visiting from YeahWrite. Liked the blog! Great idea to write about! Oops! This was one of the posts for which the notification got put (inexplicably) in my junk folder. (Okay, Sympatico, diblog has been just fine for over 3 years and it’s STILL just fine – got that???) So this is old news, but I’m going to go ahead anyway. My dad used to say that he wouldn’t trust any man who actually wanted to be the President. Same goes for P.M., eh? As for First Lady, the only reason I can think of for wanting to be that would be so that I could do my total NON-fashion thing and see what happened to the rest of the USA! Interesting thoughts, amazing responses – what a lot of thinking, literate, cool Di-hards you have, Di! Many of the comments are from the Yeah Writers! Aren’t they awesome? ?